1Meet V., a blogger and GoOpti (solo) traveler from Singapore. Can you introduce yourself? Who is V.? Hi there, I’m V. I’m a twenty-something Singaporean girl living in my tiny country with my family. Most days my life is rather ordinary—job, family & friends. However, a couple of times a year, I would leave the country to explore a bit more of the world. Alone. I write about my travels at CapturedWanders.com. You practice solo traveling. Why? What is the best things about traveling on your own? Solo traveling can be so refreshing. You travel at your own pace and you have control over every decision you make – be it an impromptu hike to see a waterfall or sleeping late into the day. Tell us about one of your favorite experiences from traveling solo. There are so many! But my favorite thus far would be the time when I booked a last-minute helicopter ride over NYC. It was something I’d never thought I’d do. Another favorite experience I had was when I was in Slovenia. I booked an ‘adventure’ hiking tour. At first I was placed with a small group but since all the other participants pulled out, I was left alone with the guide. 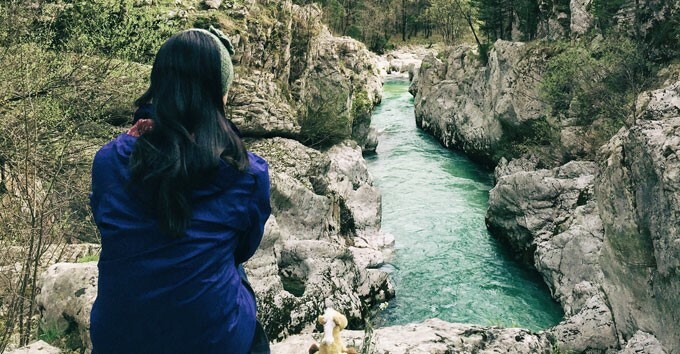 We spent two days doing some light hiking to see waterfalls, soaking our feet in the chilly Soča River, ziplining through the mountains in Bovec and eating authentic Slovenian food. Great experience. The biggest concern for women traveling solo is safety. What steps do you take to make sure you stay safe while on the road? I will always bring a safety alarm with me when I’m traveling. I never had to use it, thankfully, but I will keep it within reach when I’m walking around at night or early in the morning. I’ll also keep my family updated with my plans for the day. I also chat regularly with one or two of my friends when I’m overseas and we’re close enough that if we don’t chat for a while, they would raise the alarm. What's been your dodgiest moment on the road? I’ve only had one really dodgy experience. Thankfully. My pick up in Venice was at about 4 a.m. in the morning and my accommodation plans fell through the crack which left me scrambling for a place to stay while waiting for the pickup. I emailed a bunch of hotels and hostels in Venice that wouldn’t require the use of a vaporetto. Only one hostel replied and said that I could sit at their hostel (for free) for a couple of hours. When I got to the ‘hostel’ (it was more of a dingy budget hotel), the owner led me into a room/office and we started talking. He said that the only reason he accepted my request was because I was Asian. He was from Bangladesh. A while into our conversation, he started making unwelcome and uncomfortable verbal advances. I immediately told him that I would wait in the hallway till I had to leave. The door of the office was already open halfway so I slipped out of the room. Although it scared me a bit, I think I was more worried about the bedbugs than the man itself. When on the road, did you come across many other solo female travelers? Before I even started my first solo trip, I googled for female solo traveler blogs. A few came on the radar…but it wasn’t much. Hence, I was left with the impression that there were not many solo female travelers. Until I took off and bumped into so many of them! Most of the solo female travelers I met were in their mid-twenties and upwards. Some were taking a year off work, some were taking their annual leave to travel, some were traveling for work but all had the same desire to see more of the world. Lastly, what top 5 tips would you give to those planning or considering their very first trip alone, what advice do you have for them? 1. Just book your plane ticket. Worry about the rest later. 2. Always let someone know your whereabouts – be it a hotel staff, a family member or friend. 3. Plan your trip well but leave 1-2 days free to just explore the city you’re in, sign up for a random tour or go for a swim in the lake…leave some time for something impulsive. 4. If you feel uncomfortable in any situation, trust your gut and get out of it! 5. Don’t be afraid to ask for directions or help. Most people will be more than willing to help you out. Are you ready to embark on a new journey?